YouTubers Josh Carrott and Ollie Kendal -- Josh & Ollie -- are better known as “Korean Englishman” on the global streaming platform. With more than 3 million subscribers on YouTube, they are definitely big players in the new entertainment industry. The duo introduces Korean food to people unfamiliar with Korean culture. Josh is the channel’s host, Ollie is the editor. “I have never really considered myself as an ‘Englishman,’” Josh said at a press interview held before the 2019 CICI Korea Image Awards, held Jan. 10 at the InterContinental Seoul Coex. At the event, the creator pair received the Korea Image Stepping Stone Bridge Award for promoting Korea’s image to foreign audiences through their video contents. After talking about who he is, Josh went into his childhood. With his family moving to China when he was 12, he attended an international school where everyone else was Korean. He hung out with Korean friends, growing familiar with the culture. Returning to London, he majored in Korean language and culture at SOAS University of London. In addition to his studies, Josh was eager to let people know more about Korea. Since then, the pair has uploaded more than 419 videos, garnering some 754 million views in total. Their biggest hit was titled “English People try Korean BBQ for the first time!? !” uploaded in 2016 and so far clocking 15 million views. Around 50 to 70 percent of viewers are Korean, with the rest from among the global audience. His video did more than just record numbers. It changed the direction of food promotion for Korea. Before, the focus was on bibimbap and bulgogi, two traditional Korean dishes. But Josh wanted to introduce what young people here actually like to eat. “I was really surprised the first time I tasted Korean barbecue. It was something that I knew, but it tasted so different,” he said. “Everyone can like Korean barbecue. I knew that if I introduced the dish to my friends, family, they must love it,” Josh said. “Fried chicken has been definitely a hit in England, too. Though people don’t know (this variety) is Korean, it is popular. What is nice about fried chicken is that it is a common food in other countries too. But the taste is different with the sauce,” he said. Though the duo has been trying out other contents too, they are sure that food will always be a central subject for their YouTube videos. “Food is just one of the easiest ways to introduce a culture to someone,” Ollie said, speaking on behalf of foreigners in Korea who are not fluent in the language. “(Not speaking the language) there are barriers to interacting, whereas if you eat the same food, even if you can‘t speak the same language, you’re speaking the language of food,” he said. 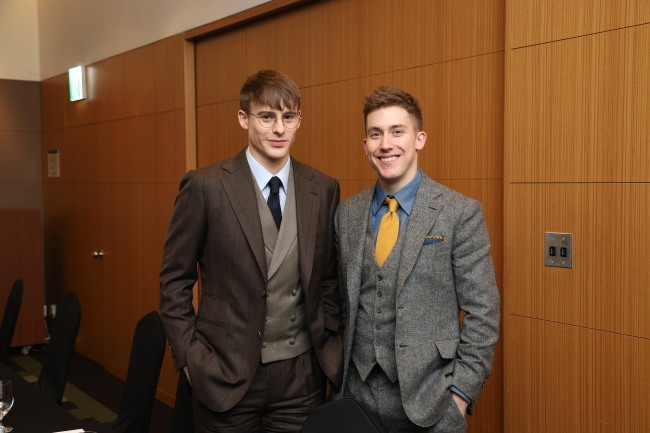 As part of the effort, actors from “Kingsman: The Golden Circle” -- Taron Egerton and Mark Strong -- had Korean fried chicken with the pair when they visited Korea for film promotions in 2017. The pair also met the “Avengers” cast and shared gimbap with them. “I would like to continue on making contents that connect Korea with England. We first started with mainly Korean viewers, but now we are going global. To make videos that everyone can enjoy, food is the right subject,” Josh said. 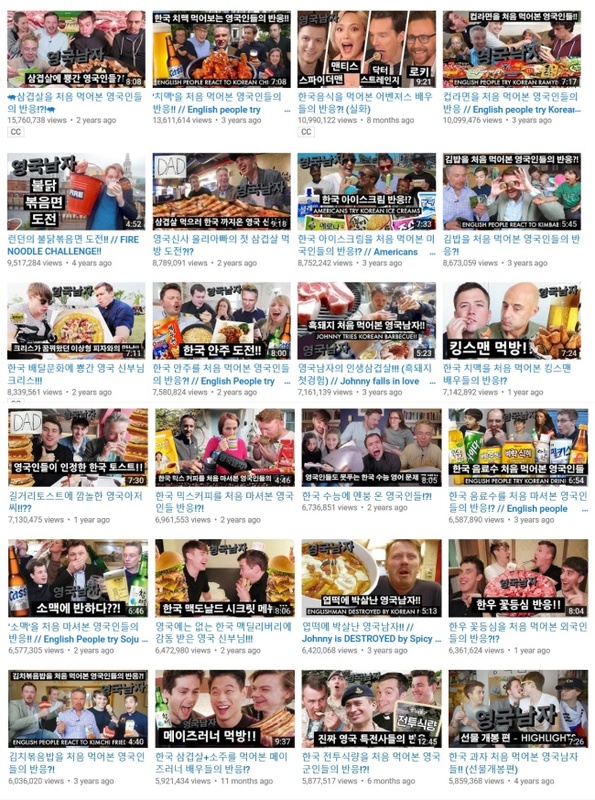 Though “Korean Englishman” is now a well-established name on YouTube, its success did not come easy. “No one can really figure out YouTube. We were stressed out a lot about the number of views, too. But one thing that we have learned is not be obsessed with numbers,” Josh said. “What we know is that we are lucky to have the opportunity to do what we do with our team. We have to do our best in making every single clip,” he added. Another reason that the British pair has been getting the spotlight is their smart use of sponsored ads. Amid their YouTube success, the platform has been an active channel for advertisements via branded content. With the increase of sponsored content, it is common to see comments concerning viewers’ dissatisfaction with a lack of original contents, complaining they were tricked into watching paid advertisements. “Korean Englishman,” however, has escaped such criticism. Fans comment that the channel’s branded content feels natural. “We have been picky about sponsorship, not making much branded contents (compared to others) from the start. In fact, we are not heavy uploaders compared to others -- some YouTubers upload a video every single day,” Josh said. “If we are going to make branded content, we will do it if we can make it like other clips. If we can’t, we do not make the video,” he said. The duo now runs two channels. With a second channel, Jolly, launched in 2017, the pair has become more experimental: Ollie learns Korean, they do an eating show at a British convenience store and more. The viewership is more international for this channel, with 1 million subscribers -- 20 percent are Koreans and the rest are global -- generating a total of 12 million views so far. “It is certainly scary. The last five years on YouTube has been insane. We are just a very small part of that. The platform offers us opportunity, creativity and freedoms that we wouldn’t have had in conventional media,” Ollie said. Fans have gone as far to say Josh & Ollie should be appointed as honorary ambassadors of Korea for voluntarily promoting Korean food and culture to foreign audiences. These fans say they are doing more than some national institutions. “We get feedback that say they plan to visit Korea after watching our videos. Around six months after we started YouTube, a person from Brazil wrote us that he will be visiting Korea after watching our videos,” Josh said.